These startling words are even more shocking considering who Jesus was addressing. “There was a man of the Pharisees, named Nicodemus, a ruler of the Jews: The same came to Jesus by night, and said unto him, Rabbi, we know that thou art a teacher come from God: for no man can do these miracles that thou doest, except God be with him. 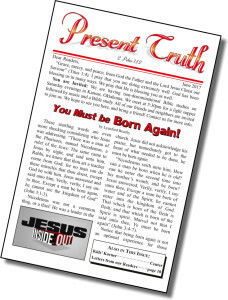 Jesus answered and said unto him, Verily, verily, I say unto thee, Except a man be born again, he cannot see the kingdom of God” (John 3:1-3). Nicodemus was not a common thug, or a thief. He was a leader in the church. Jesus did not acknowledge his praise, but immediately got to the heart of what needed to be done, he must be born again. “Nicodemus saith unto him, How can a man be born when he is old? can he enter the second time into his mother’s womb, and be born? Jesus answered, Verily, verily, I say unto thee, Except a man be born of water and of the Spirit, he cannot enter into the kingdom of God. That which is born of the flesh is flesh; and that which is born of the Spirit is spirit. 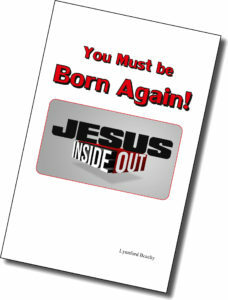 Marvel not that I said unto thee, Ye must be born again” (John 3:4-7). Notice that being born again is not an optional experience for those wanting to go to heaven. It is a necessity! Unless this happens we will not be able to enter the kingdom of heaven. But what if I was born in a Christian home? What if I have never done any of the bad sins, like murder, stealing, adultery, drug dealing, etc.? What if I think that my life is perfectly fine and I am acceptable just as I am? What if I feed poor people, and mow the neighbor’s yard? Those are all good things, but none of that counts towards salvation! You must be born again! You may have heard it said that we were created in God’s image. Well, that was true until sin entered the world. “…God created man, in the likeness of God made he him… And Adam lived an hundred and thirty years, and begat a son in his own likeness, after his image; and called his name Seth” (Genesis 5:1-3). Adam was created in God’s image and likeness, then he lived for 130 years before he had a child named Seth. A lot happened in that 130 years, most notably, Adam ate the forbidden fruit. He sinned, and lost much of his likeness to God. Sure, man still looks like God in appearance, but his character certainly changed after he ate the fruit. If Adam would have had children before he sinned, then we would have been born in the image of God. But Adam’s children were born after he sinned, and he passed on that sinful likeness to his children. All of us were born in need of being born again. It doesn’t matter how nice of a person you are or how little you do bad stuff. I used to think that as long as my good deeds outweighed my bad ones, then I would go to heaven. Actually, it doesn’t work that way. Even if you have done 200 good deeds today, that cannot possibly make up for one bad deed. Even the 200 good deeds you did today are tainted somewhere with selfishness and pride. You see, “We are all as an unclean thing, and all our righteousnesses are as filthy rags” (Isaiah 64:6). There needs to be something that takes away sinfulness from your core, the very root of how you live your life. Fortunately, that is exactly what Jesus offers to do for each of us. That is why He became a man and “was in all points tempted like as we are, yet without sin” (Hebrews 4:15). His plan is to give you a new life. He introduced a new element of life and power into the human race. “For in that he himself hath suffered being tempted, he is able to succour [help] them that are tempted” (Hebrews 2:18). Let the beauty of that sink in. God is working on each of us to bring us to the point where we are willing to throw it all in, to say, “It is enough. I am at the end of my rope. I need something outside of myself.” It is when we get to this point that amazing things can happen. The first thing to do when you come to Jesus is not to pray a prayer to go to heaven. I know that is commonly taught, but Jesus said the first thing you do is deny yourself. Jesus explained, “If any man will come after me, let him deny himself, and take up his cross daily, and follow me” (Luke 9:23). This is a three-step process, 1) Deny yourself, 2) Take up your cross, 3) Follow Jesus. These steps must be done in that order. It will not work if you skip to step three without taking the first two steps. Those who go about it that way will end up miserable. Sadly, that is the way many Christians attempt to follow Jesus. Jesus said, “He that loveth his life shall lose it; and he that hateth his life in this world shall keep it unto life eternal” (John 12:25). He says a person must hate his life. That does not mean that he must wish to end his life physically. Instead, he must recognize that his life without Christ, no matter how nice it seems to be, is not worth living anymore. Until you realize that your old life is not worth trying to save and fix, that you need an entirely new one, you will not be ready to be born again. One time a young man came up to Jesus asking, “Good Master, what shall I do that I may inherit eternal life? And Jesus said unto him, Why callest thou me good? there is none good but one, that is, God. Thou knowest the commandments, Do not commit adultery, Do not kill, Do not steal, Do not bear false witness, Defraud not, Honour thy father and mother. And he answered and said unto him, Master, all these have I observed from my youth. Then Jesus beholding him loved him, and said unto him, One thing thou lackest: go thy way, sell whatsoever thou hast, and give to the poor, and thou shalt have treasure in heaven: and come, take up the cross, and follow me” (Mark 10:17-21). Notice the three-step process in Jesus’ response. Step one for this man was to sell everything he had and give to the poor. For him, this was denying himself. After that, he was to take up his cross and follow Jesus. Now, Jesus does not ask everyone to sell everything and give the money away, but for this man, that is what he needed to have a completely new life. He had to recognize that his old life must be given up, so he could have a new life in Christ. This would have allowed him to go on to the next step. There is nothing in this world that deserves our love more than Jesus, including our own lives. When we come to the point where we are willing to give our entire lives for Jesus, that we no longer want to live for ourselves, then we have denied ourselves. Until that happens, we cannot be disciples of Jesus, and we cannot move on to steps two and three; take up our cross and follow Him. For some, coming to that point takes a severe life-altering experience, for others it takes the bitter disappointment of trying to live a godly life on their own. But in every case it can only be reached through a deeper insight into the love of God for you, individually. This is the work of God in each of our lives. God gives us His Spirit to open our eyes to see His love. “…the love of God is shed abroad in our hearts by the Holy Ghost which is given unto us” (Romans 5:5). Then, as we see God’s love, “…the goodness of God leadeth thee to repentance” (Romans 2:4). Repentance is when we come to God, sorry for our sins, and ask Him to forgive us. Then God makes a new covenant with us. God promised, “This is the covenant that I will make with them after those days, saith the Lord, I will put my laws into their hearts, and in their minds will I write them; And their sins and iniquities will I remember no more” (Hebrews 10:16, 17). The new covenant is a promise for God to put His laws into our hearts. This does not mean that He supernaturally causes us to memorize His laws. No, it is much, much deeper than that. “A new heart also will I give you, and a new spirit will I put within you: and I will take away the stony heart out of your flesh, and I will give you an heart of flesh. And I will put my spirit within you, and cause you to walk in my statutes, and ye shall keep my judgments, and do them” (Ezekiel 36:26, 27). These are the verses that changed my life. My dad told me to ask God to give me a new heart, invite Jesus to live in my heart, and then believe that I have it because He promised. He said that I will not feel anything change, but that if I keep believing that I have a new heart, I would notice a change after a few days. It was exactly as he said. After a few days I noticed that I responded to things differently. When someone did me wrong, I no longer had a desire to get even. Instead, I felt compassion for them. This was totally new for me. Everything changed. I became a new creature. He put His Spirit within me to cause me to want to follow His laws. Before I became a Christian, I thought, “I don’t want to be a Christian, then I will not be able to do the things that I like to do. I will not be able to go to parties, do drugs, etc.” What I didn’t realize is that when God gives you a new heart and puts His Spirit within you, your likes change. You no longer enjoy doing the bad things you used to do. Drugs were no longer appealing to me. It became enjoyable to follow the Lord. “I delight to do thy will, O my God: yea, thy law is within my heart” (Psalms 40:8). You see, the result of putting God’s law in your heart is that you now delight to do His will. It is not a burden or a chore. His “yoke is easy” and His “burden is light” (Matthew 11:30). This is not true when you try to follow Jesus without first denying yourself and letting the old man die. In the old life, following Jesus is heavy and difficult. The Bible says, “…the way of transgressors is hard” (Proverbs 13:15). It is already a hard life to live contrary to God’s law, but when you add to that experience a human attempt to follow God, it becomes very hard. If you are struggling with some sin, there is only one way to be victorious. Even if you are able to force yourself not to do that sin anymore, you will not be successful unless your desires change. If your heart is not replaced with the heart of Christ, sin will just come back in another form. Jesus didn’t have to force Himself to get out of bed and minister to the needs of those around Him. That was His delight. He thoroughly enjoyed being nice to people and blessing them. 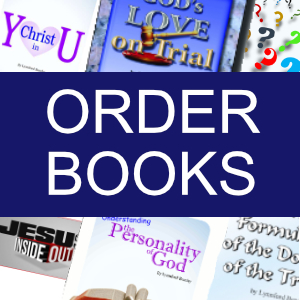 God’s law, God’s character, flowed out from His heart. That is just the way He was. It was natural for Him to live the way He did. He was connected to His Father. He said, “Believest thou not that I am in the Father, and the Father in me? the words that I speak unto you I speak not of myself: but the Father that dwelleth in me, he doeth the works” (John 14:10). This attitude, this life that Jesus lives, He offers freely to all who ask for it. “And because ye are sons, God hath sent forth the Spirit of his Son into your hearts, crying, Abba, Father” (Galatians 4:6). God gives you the life, the Spirit of His Son to live in you. This is the New Covenant. This is God writing His law in your heart. It is much more than causing you to memorize a list of dos and don’ts. It is Him living His life in you. There is no list of dos and don’ts big enough to fit every situation in life. 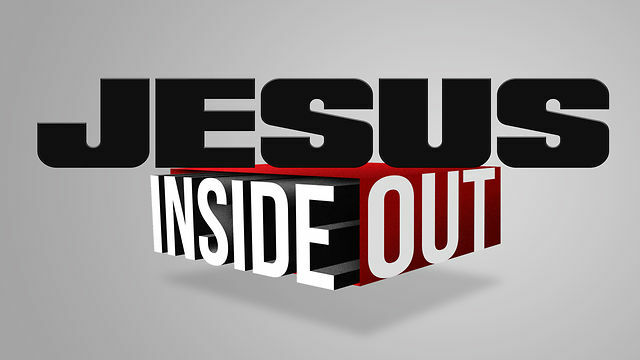 Jesus living His life in you is the only way you can come “unto the measure of the stature of the fulness of Christ” (Ephesians 4:13), and “be filled with all the fulness of God” (Ephesians 3:19). This does not do away with the law, it magnifies it a million times (Isaiah 42:21; Matthew 5:17; Romans 3:13). Paul exclaimed, “I am crucified with Christ: nevertheless I live; yet not I, but Christ liveth in me: and the life which I now live in the flesh I live by the faith of the Son of God, who loved me, and gave himself for me” (Galatians 2:20). Here we see the elements of the three-step process of being born again. Paul was dead, he had denied Himself and taken up his cross. The life he began living afterward was the life of Christ. This is a life of faith, but not Paul’s faith, “the faith of the Son of God.” You may have weak faith, but no worries, you don’t have to depend upon your faith. You get the faith of the Son of God, which is great indeed. You see His faith is a fruit of His Spirit (Galatians 5:22). Along with that fruit, we get His love, which is also amazing. He constantly looked upon people and loved them, He was moved with compassion for them. He said, “By this shall all men know that ye are my disciples, if ye have love one to another” (John 13:35). Love for others is a natural result of being born again. Being born again is being born of God by receiving the Spirit of His Son. That is why He said, “A new commandment I give unto you, That ye love one another; as I have loved you, that ye also love one another” (John 13:34). This new commandment was not introduced until Christ came to demonstrate it, infuse it into humanity, and then impart it to us. He gives us His Spirit; His life to be lived in us. The work of God to transform us into the image of His Son is incredible! You are chosen by God “to be conformed to the image of his Son, that he might be the firstborn among many brethren” (Romans 8:29). Being born again is an entire, drastic change. Keep in mind that being born is only the first step of the new life. There is still eating and growing to do, yet it all starts with being born. The total transformation requires power outside of ourselves. “But as many as received him, to them gave he power to become the sons of God, even to them that believe on his name: Which were born, not of blood, nor of the will of the flesh, nor of the will of man, but of God” (John 1:12-13). This power given in the new birth radically changes you, and as you eat (learn more about God) and grow (your life changes) that transformation becomes more apparent. This is a brand new creation, you become a creature that did not exist before. The Bible says, “Therefore if any man be in Christ, he is a new creature: old things are passed away; behold, all things are become new” (2 Corinthians 5:17). When you are born again you are created with a new element of life and power. 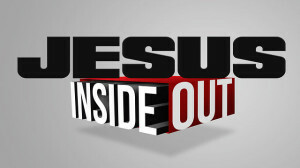 Christ lives in you now. Old things pass away and all things become new. Now, let them pass away and let the new be enjoyed and realized and lived. The Bible says, “Beloved, follow not that which is evil, but that which is good. He that doeth good is of God: but he that doeth evil hath not seen God” (3 John 1:11). This is an amazing verse because it puts a direct link between how we see God and whether or not we do evil. Doing evil is a side effect of not seeing God correctly. Therefore, doing good is a side effect of seeing God correctly. How you see God directly affects how you think and how you act. Keep in mind that none of us have seen God physically (John 1:18), however, God shined His character through His Son, Jesus Christ (2 Corinthians 4:6). You see, sin began on this earth when Eve’s perception of God changed. She had thought that the forbidden fruit was bad for her, and that God was good to keep it from her. Then Satan tricked her into believing the fruit was good, and therefore God was bad to keep it from her. “And when the woman saw that the tree was good for food, and that it was pleasant to the eyes, and a tree to be desired to make one wise, she took of the fruit thereof, and did eat, and gave also unto her husband with her; and he did eat” (Genesis 3:6). Satan’s main goal in the garden was to change Adam and Eve’s perception of God, so that they would see Him as someone to be afraid of, someone who does not love them. It was this twisted perspective on God that began sin in this world, and it is a revelation of God’s character of love that will bring us back to living like God created us to live. As we behold His love more and more clearly, sin will become less and less desirable. God is working to reveal a deeper view of His love to each of us. “For this cause I bow my knees unto the Father of our Lord Jesus Christ, Of whom the whole family in heaven and earth is named, That he would grant you, according to the riches of his glory, to be strengthened with might by his Spirit in the inner man; That Christ may dwell in your hearts by faith; that ye, being rooted and grounded in love, May be able to comprehend with all saints what is the breadth, and length, and depth, and height; And to know the love of Christ, which passeth knowledge, that ye might be filled with all the fulness of God.” (Ephesians 3:14-19). There is a direct connection between how you see God’s love, and how fully you will be filled with God’s character. As you behold, you will be changed (2 Corinthians 3:18). Everyone who looks “shall live” (Numbers 21:8). “As ye have therefore received Christ Jesus the Lord, so walk ye in him” (Colossians 2:6). When I asked Jesus to live in my heart, I believed that He came in because He promised (Revelation 3:20). I kept believing that He had given me a new heart, and that He was living in me. It was this continual belief and focus on Him that kept the new birth alive. Yes, I have stumbled and allowed the old man to take over at times. But I say, “Rejoice not against me, O mine enemy: when I fall, I shall arise; when I sit in darkness, the Lord shall be a light unto me” (Micah 7:8). “For a just man falleth seven times, and riseth up again: but the wicked shall fall into mischief” (Proverbs 24:16). The difference between a just man and the wicked is that a just man riseth up again, by coming to Christ for forgiveness. We are to walk in Christ in the same way that we received Him to start with. Christ dwells in your heart “by faith” (Ephesians 3:17). That is how He got there to start with, and that is the only way He will stay there. Don’t stop believing, regardless of your circumstances. When Peter looked at his circumstances, he sank (Matthew 14:28-31). You will too, if you do that. Look to Jesus and His promises, for it is by these that you are a partaker of the divine nature (2_Peter 1:4). Jesus gave one of the most helpful illustrations to maintain the new birth when He said, “I am the true vine, and my Father is the husbandman. Every branch in me that beareth not fruit he taketh away: and every branch that beareth fruit, he purgeth it, that it may bring forth more fruit. Now ye are clean through the word which I have spoken unto you. Abide in me, and I in you. As the branch cannot bear fruit of itself, except it abide in the vine; no more can ye, except ye abide in me. I am the vine, ye are the branches: He that abideth in me, and I in him, the same bringeth forth much fruit: for without me ye can do nothing. If a man abide not in me, he is cast forth as a branch, and is withered; and men gather them, and cast them into the fire, and they are burned. If ye abide in me, and my words abide in you, ye shall ask what ye will, and it shall be done unto you. Herein is my Father glorified, that ye bear much fruit; so shall ye be my disciples” (John 15:1-8). How hard does a branch connected to the vine have to work to produce fruit? Not at all! The fruit comes as a natural result of being connected to the vine. “He that abideth in me, and I in him, the same bringeth forth much fruit” (verse 5). The only job of the branch is to stay connected to the vine. Bringing forth fruit will come naturally. Do not lose sight of this. If your thoughts and actions are not right, go plug into the power source. You cannot do it on your own. It is not even your job. The Father is the vinedresser, His Son is the vine, you just need to make sure you stay plugged in. That is where all of your focus should be. The fruit will come naturally. If you try to do the job of the vinedresser or the vine, and try to make fruit come out, then it will be fake. You may think it is unnoticeable, but it is visible to those around. People can see if you have been with Jesus. Maybe when you were a child you were told to say, “I’m sorry” for something. When you are forced to say, “I’m sorry,” Is it real? Are you really sorry? You may be sorry a little, but if you have to be forced to say it, it probably is not genuine, and it will usually be noticeable that it is said grudgingly. Someone who is genuinely sorry will go overboard to make sure you know that they are sorry. Even so, fruit that is genuine is not forced, but natural. If you focus on producing fruit, it will be fake. But if you are constantly paying attention to your connection with Jesus, Jesus will flow out of you everywhere, He will give life to every interaction you have with others. Being born again is a must-have experience for all those who will go to heaven. The reason this is so necessary is that we were born with a carnal, sinful nature that is naturally selfish and bent towards sin. The new birth is a gift, the implanting of the life of Christ in our hearts, as the living law that will transform every part of our lives. This gift is offered freely to all those who ask for it and accept it by faith. Keeping our thoughts focused on Jesus and His goodness will keep our lives pure and clean. One way of doing this is to listen to the Bible throughout the day. I have been doing this, and it is amazing how helpful it is. If you do not have an audio version of the Bible, you can download it for free in many different languages and versions at www.faithcomesbyhearing.com. I copied the audio Bible to my phone, so I can have it playing wherever I am. Focus on your connection with Christ, and other aspects of your life will fall into place. Do not get this backwards, or you will not have success. You are in my prayers. Stay close to the Lord, and He will bring forth fruit in your life that will amaze everyone including yourself. May God richly bless you above what you can think or ask. Thank you for your encouragement. I pray that this study will bless many people.